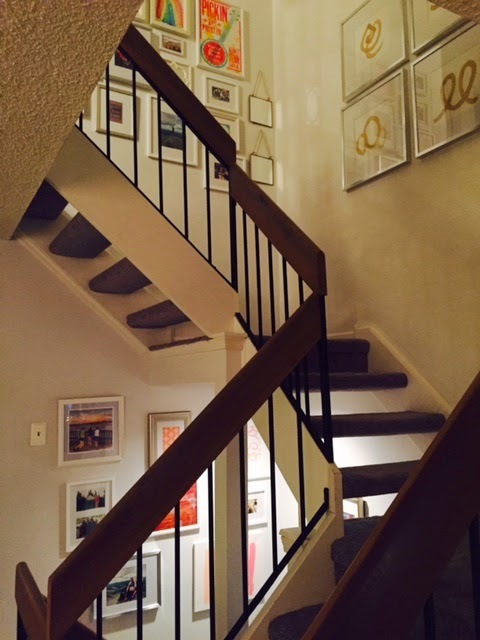 Swoon Style and Home: Stairwell Gallery: Done! Another project in the books! 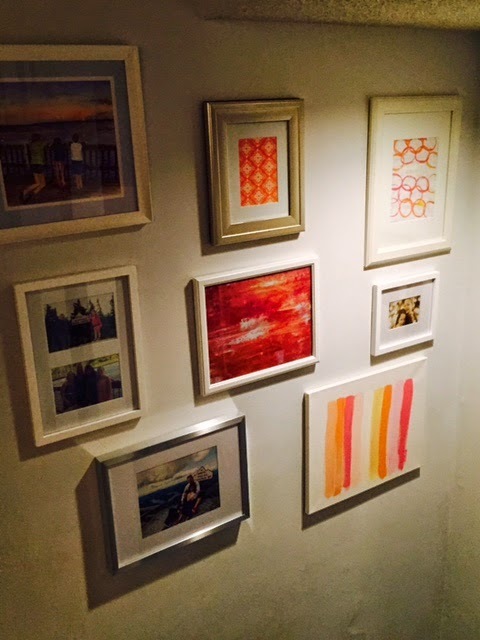 This one is my stairwell gallery. I am so happy with the end result! I started this project a few months ago and posted about my initial progress here. 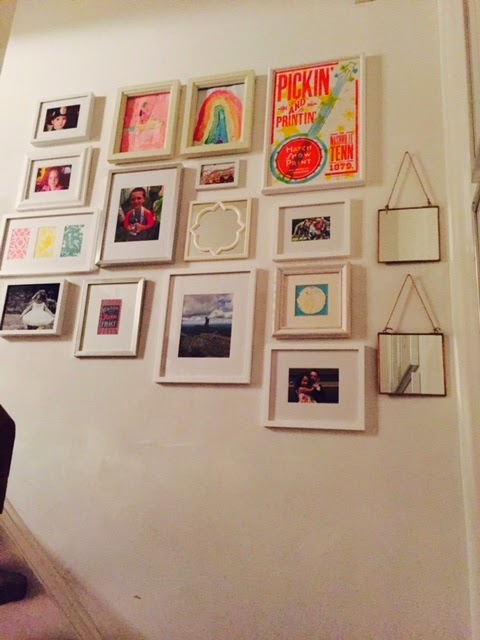 I had all of my frames in place and needed to fill them with photos, prints and kids' artwork. It took a little while, but I finally did it. Normally I gravitate toward black and white photos, but in this case I felt color photos and prints was important because of the wall color. The wall color in my house is white but with very prominent blue undertones. So, the walls look almost blue. But a sad depressing blue. It *kills* me that this awful color is all over the house. And rather than spend the time and money repainting it, I figured I would try to work with it and at least minimize it. 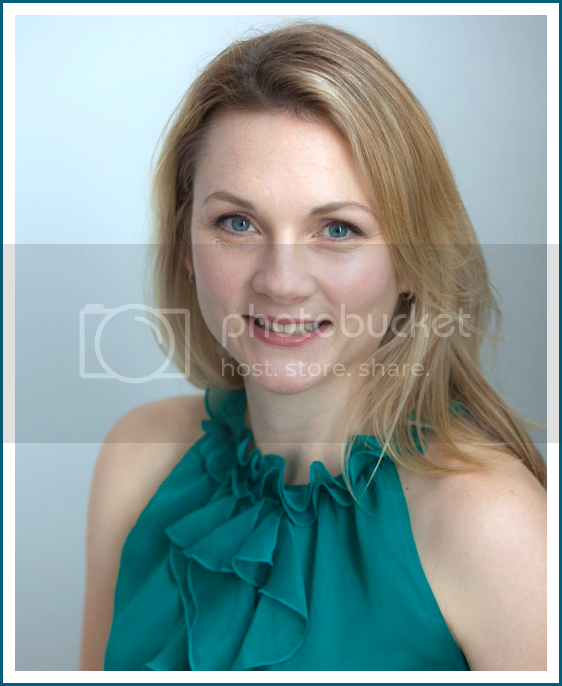 I knew if I used black and white photos, the blue would look even bluer. But if I added pops of color, it might make the wall read a bit more white than blue. I think it worked! I apologize for the iPhone photos, but that's how I am rolling lately. Here are some of the other walls. First, the lower wall. I used a mix of photos, paintings, prints and kids' artwork. I tried to keep a unified color scheme, and coral, yellow and pink seemed best. I even made my own new art. Just some simple brushstrokes on canvas. Easy and inexpensive. This is the lowest wall. 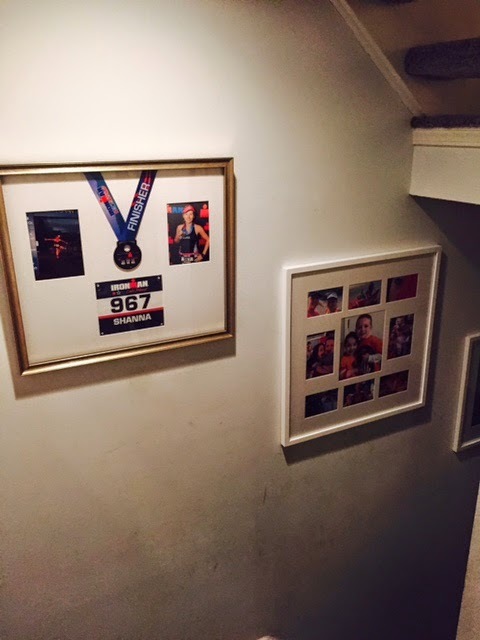 I had my Ironman medal, race number and photos professionally framed. I am so glad I did (but wow it was a splurge). 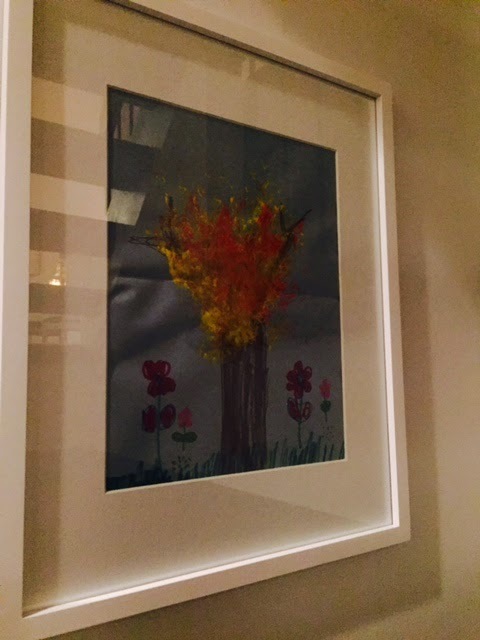 I also have a multi-photo frame and a framed picture that Little Girl made. I love it all. Finally, the upstairs wall is a mix of more coral, gold, turquoise and pink. I did another mix of photos, prints, art and in this case mirrors. I love walking up the stairs and checking out my hard work. Yes! Done! And with that, I've completed almost all of my 2014 Home Resolutions! A big recap post is on the way soon.